Top Photo: Early Harrington Light Draft hillside combine manufactured at Harrington, Washington, owned and driven by Ira K. Charlton on his place south of town. Middle Photo: Pre-Harrington Manufacturing Co. factory behind the concrete wall, hosting a livestock show. To the left of the center group of 4 is Herman S. Bassett “The Sagebrush Bard” and publisher of the Harrington Citizen until 1959, and to the right is George “Doc” Unbewust, DVM, first veterinarian in Lincoln County. A drive through Harrington, WA today provides little evidence of the thriving community it once was. Some grand brick buildings like the Opera House offer a clue, but only its citizens and newspaper are left to tell the bigger story. Part of the history has been archived in the form of pictures, documented by master photograpers. One was Joshua Elmer, a Krupp, WA photographer using his homemade 9×19 camera. His pictures are tall compared to the width, like the one above before it was cropped. Other pictures bear witness to photogs using rotating Kodak Cirkut panoramic cameras, as evidenced by the picture below, that are very wide and short. The manufacture of combine related parts and equipment in Harrington, Washington, has a long history. It began in 1905 when Gordon, Throop & Co. built a plant to produce drapers (up to 50 feet), header boxes, wheat racks and other related products. E. R. Gordon’s resume included employment by Holt Manufacturing Co. of Stockton, CA, a leading combine manufacturer that had developed hillside leveling technology in 1891. As a historic side note, the first combine equipped with an engine was a hillside model built by another Stockton manufacturer, Harris. 1834 marked the first recorded production “combine” by Moore and Hascall. It utilized a rotating drum to separate the grain, instead of a cylinder. It had a 10-ft. cut and was pulled by 16 horses. The Holt combine, in a round about way, came to be owned by John Deere. In 1911, Holt registered the name “Caterpillar”. Because of economic conditions, in 1925, Holt and Best, both crawler tractor manufacturers, merged under the name Caterpillar Inc. They in turn divested themselves of the Caterpillar Holt combine division to Deere Harvester Works in 1935 along with its steel, as opposed to wood, Holt 26×36 combine with a Wisconsin engine. The Holt engine continued service powering the Caterpillar 22 crawler. The 1936 John Deere model 36 was identical to the Caterpillar Holt 26×36 Standard, with exception of the Hercules 6-cylinder engine. Production of that machine continued until 1948. Lewis A. Dunning and Charles A. Erich formed a partnership in April 1908 under the name Dunning-Erich Harvester Co. They bought the Gordon-Throop-Wolfe building in 1909 and with a crew of 10 men the following year began production on a wooden framed, wooden clad, ground powered machine. 3 were built in 1911, and 22 in 1913. Dunning brought his experience as President of Dunning Bros. Co., a Marysville, CA, harvester repair company. Erich was also employed by him. Most farmers cut and hauled their crops to stationary threshers in those days, so combined harvesters, stationary threshers combined with push headers, hence “combines”, were new to the marketplace. Even with the new machines, stationary threshers dominated for decades. By October of 1911, an addition had been completed to house the foundry. In 1913, the company began production of engines as well. The foundry gave them the means to make almost every part on site. The top photo, perhaps a 1913 model, appears to be ground powered, so maybe engines were offered as an option that year. An Erich designed Barley Mills barley roller was also introduced in 1913. It boasted a capacity of 1.5-tons/hour, depending on the amount of power applied. A larger, 6-cylinder tracked tractor was introduced in 1918, rated at 25-50-hp, and tested on the John Russell farm two miles east of Harrington. It had enough power to pull two 3-bottom plows with 14 inch shares, 7 or 8 inches deep, up hill in high gear going 2.5-mph, according to Russell. Louie Linder of Connell purchased that tractor for $4,500. After using it a short while, he named the 13,000-lb behemoth, “Bear Cat”. It boasted a new governor that fed more fuel to the carburetor when the engine was under load. Plus, it had one-piece track shoes, Hyatt Roller bearings throughout, automatic track oiling that only functioned when the tracks were turning, and extra long tracks, 5-1/2-ft.x16-in wide. Each side was geared separately, allowing the tractor to turn around in its own length. At that time, it was innovative to be able to stop one track and keep power to the other. The late teens brought $2.00 wheat and poor yields, and Erich bought Dunning’s shares in 1919. A new, smaller 12-ft. cut model was offered for sale, weighing 2 tons less than its big brother. It required half the horses and required three or four men as compared to 5. The larger machine cut a 20-ft. swath. The choices were: 40 acres/day vs. 25 acres/day. $4,600 vs. $3,200. 35-hp. vs. 25-hp. A total of 63 new machines were sold that year. In addition, the company also made parts for, and repaired competitive harvesters and tractors in their shop. A stronger, 1,000-lb. heavier machine was introduced in 1921, and had leveling capabilities of 40% in both directions. The company claimed that its separating ability had no equal on the market. The previous fall, the U. S. Threshing Inspector prohibited the use of some non-leveling machines because they were wasting more than 15 percent, the maximum allowed by law. According to their statistics, the average combine loss nationally was 8 percent, but the Harrington cut that in half. 1920 brought a company reorganization and the name changed to Harrington Harvester Company. 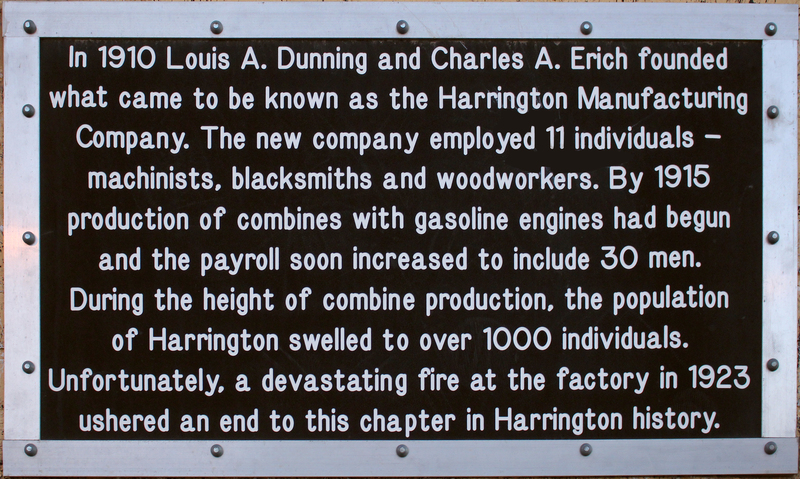 The largest and most disastrous fire in the history of Har­rington occurred Saturday afternoon of last week when the main building of the Harrington Manufacturing Company took fire and burned to the ground, an almost total loss. The fire started from the metal furnace, a piece of burning coke probably having been blown up on the tar roof. Some of the boys saw the fire when it was small and began fighting it with a small garden hose and hand extinguishers. It was about ten minutes before the fire truck arrived and by that time the fire had got such a start, that it was impossible to save the building and only by hard work and the good fortune of some strong concrete walls was that whole end of town saved from the flames. The two large storage buildings were not damaged but the nearest one caught fire several times. People living in that district removed their furniture and the streets and alleys were full of refugee materials for some hours after the fire was under control. When the blaze was at its height the Davenport fire department was called upon for aid and made the run over here with about 15 men in about 25 minutes. They rendered substantial aid in hold­ing the fire in check and the people of Harrington deeply appreciate their assistance. From those who saw the affair from the beginning it­ seems to be the general opinion that several valuable min­utes were lost some place before the fire team responded. Some one at the factory called central and asked that the fire department be ordered down to the factory. ‘Central’ has instructions to call the chief in case of fire or trouble and phoned the city hall where a street bell is located. Fail­ing to get an answer the McKinnon residence was called. Mrs. McKinnon answered the phone and central asked for the fire chief. Jim was in the wash room and stepped to the phone, when he was told that the department was wanted at the factory. Jim beat it to the station, rang the bell and then phoned central to know if there was a fire. Central did not know there was a fire when she first called the fire chief, but by this time the information had come in from various sources that the factory was on fire. The fire team responded to the bell as quickly as ever. Ward Ellis and Nat Cameron stated that they were help­ing pour when the fire was discovered. With the garden hose in action and a man on the run to notify central they continued pouring until the molten pot of metal was emp­ty. Then they got impatient, ran to the front of the build­ing, cranked an auto and got up in the front of Richardson-Monks Hardware store when the bell rang. Miss Mary Davis, the tele­phone manager here, was quite incensed at the severe and rather hasty criticism with which some of the lo­cal people condemned the operator on duty. ‘Fortu­nately I was also on duty at the time’ she said, ‘and I am glad to say no operator could have done better. I absolutely endorse the action of my op­erator in every particular and we would do the same again tomorrow under similar cir­cumstances’. Various persons also state that the water pressure at first was not sufficient to reach the roof but the pumps were soon started and the pressure was then adequate. But by that time the flames had gotten too far advanced and probably four times the amount of water could not have saved the building. Added to the other tragedies the doors of the pattern room were left open and the fire got in. The roof supports were burned and the roof fell in. As a result the patterns, which are the slow accumulations of the past 14 years are all gone up in smoke. This was the larg­est single loss. Whether this room was really fire proof and would have withstood the fire had the doors been closed, is a question. Mr Ellis, the manager, stated that the loss would run be­tween $200,000 and $225,000 and the insurance is close to $40,000 on the building and contents. The main loss was the building and patterns. Other main losses were two har­vesters, a track-laying tractor, the heating plant, machinery equipment and supplies. Most of the office fixtures were saved as were the books of the company. The insurance adjustors are expected today. After the insurance is adjusted and the board of directors meet, the public will know the future of the factory. The company continued in limited fashion, under the name The Grain Belt Manufacturing Co. They completed another foundry April of 1929, but the company was never again successful. The property was sold to Albert Armstrong and Delbert Demig in 1950 under the name A D Welding. John Eck­hardt purchased it in 1960, and ran his machine shop there for many years, and resumed the foundry work as well. Today, not a piece of a Harvester is known to exist. The only hard evidence of their existence is one single engine and a couple of Barley Mills. Author’s Note: Thank you to Mayor Paul Gilliland for his help coordinating this research, and to Marge Womach, Leonard Robertson and Lorry Dunning for their extensive research assistance, and to Jerry Smith for allowing the use of his factory photo, and to Paul Charlton for the use of the photo of his grandfather on his Harrington Harvester.